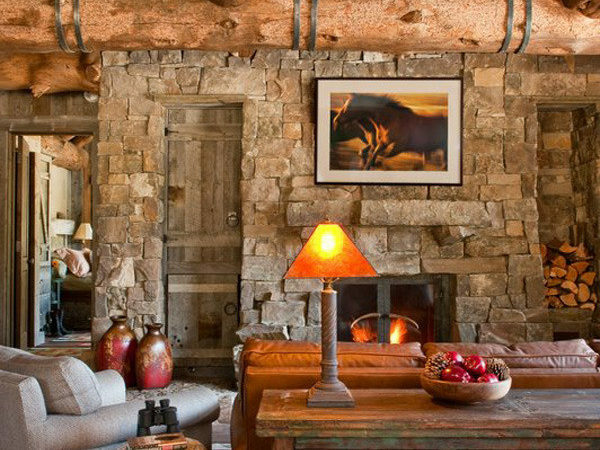 Sitting in Montana’s Yellow Stone Club, is this beautiful rustic log home. The Yellow Stone Club is a private residential community, which covers over 15000 acres of land. The community which is set in the Rocky Mountains, is the perfect setting for year- round recreation and mountain living for families. 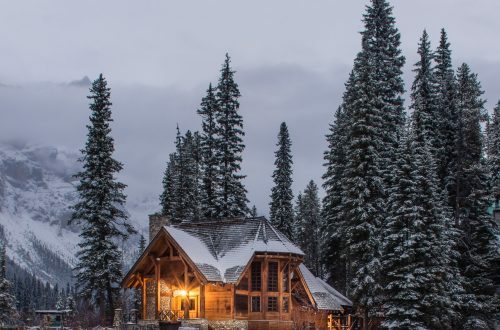 This dwelling was built in 2012, is situated on 22 acres of land, and the design and architecture of this gorgeous home fits right in with the environment. The property is the perfect retreat, surrounded by trees and nature. 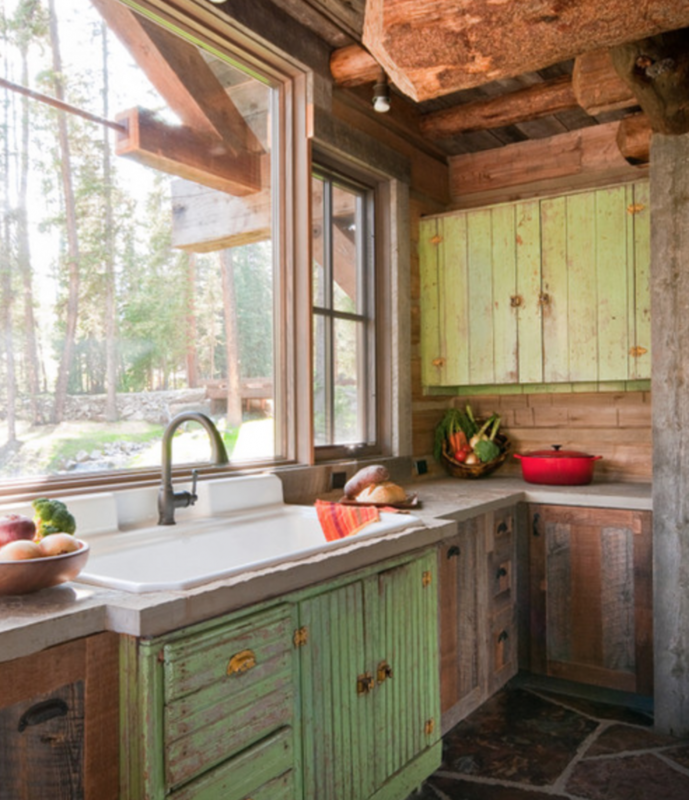 Rustic accents and furniture creates a warm ambiance in this cabin. 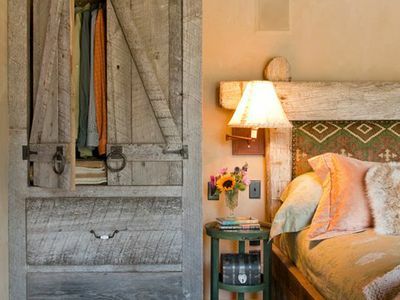 An old tree stump is used as a side table in the living area, distressed wood for pieces like the bedframe and closet, and also a rustic chandelier with chains in the dining area. The dwelling is designed with many glass windows and doors. This allows for light to enter the home, and fresh air during spring and summer. Also, it makes the perfect setting for taking a walk outside at sunset, and getting a beautiful view of the home with light in it’s many windows. 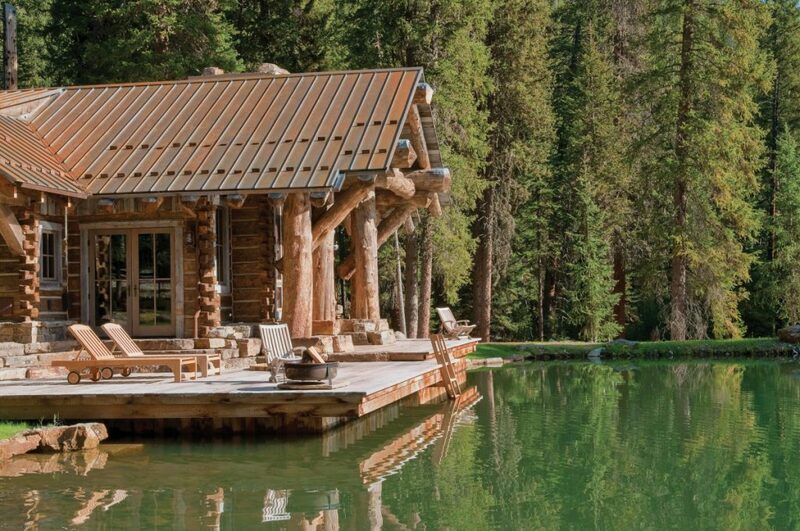 This cabin is the epitome of a log home. There is wood everywhere. This makes the home always warm, and having a welcoming atmosphere. Stone is also a part of this dwellings structure. You will feel like you have a bit of the outside when you are inside of this house because of the stone. 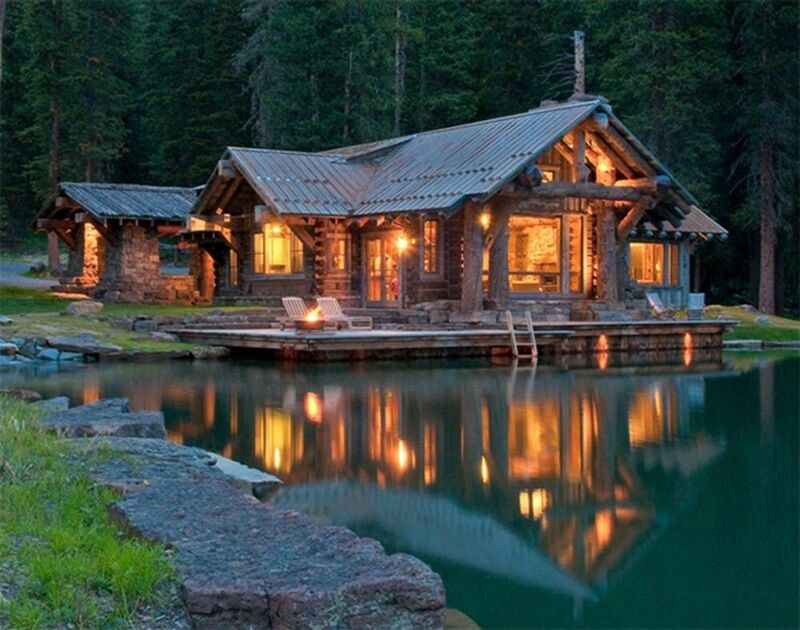 The home seems to be set on the edge of a lake. But this is actually a series of man- made water bodies. 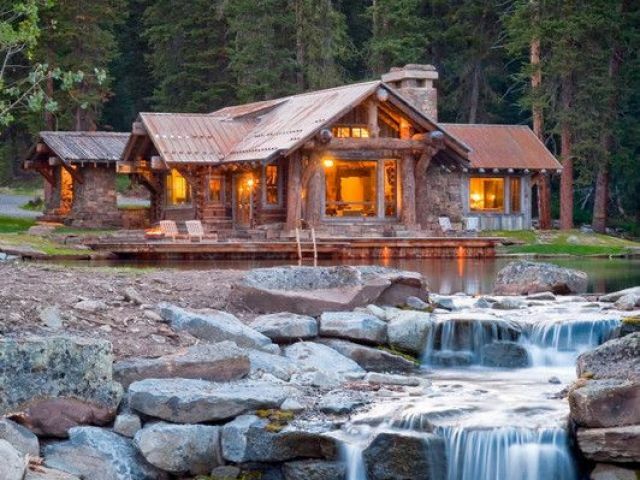 This water feature is man- made, but not short of creating the ultimate lake house ambiance for a weekend get- away. 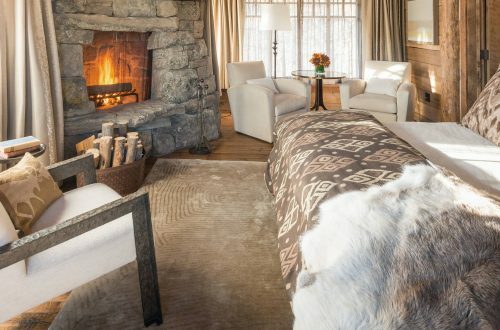 The wood- burning fireplace is the perfect place to relax with a good book, and some hot chocolate on a cozy winter or autumn evening. Summer or spring? Well, cozy up with your book and maybe a cold glass of lemon juice. The bedroom will probably be your favourite room in this house. The ceiling is beautifully designed with logs, and the bedframe will make you feel like you are a character in a woodland storybook. The kitchen gives a surprise not only with tiled flooring, but also with a pop of colour. The cabinets are all wood, but some are brightly painted, which gives a little contrast. The bathroom has an elegantly shabby ambiance. 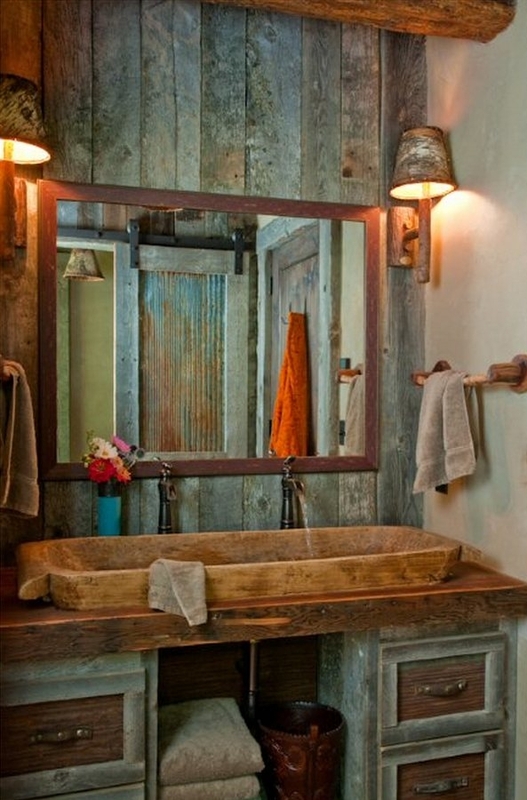 There is a rustic wooden wall, a wooden sink, shabby lampshades, a sliding door made of wood and zinc, and a rustic towel rod. 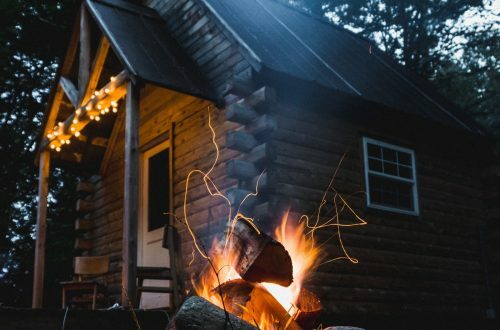 Hope you enjoyed touring this gorgeous cabin. 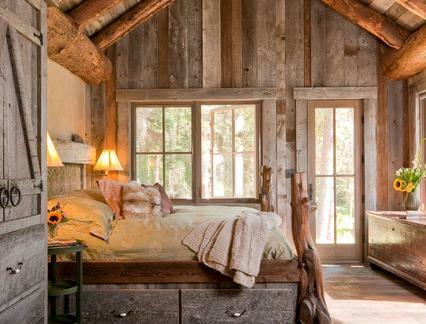 If you liked this, you will like these log home bedroom ideas too.